The Leon plug-in hybrid (left) and Altea EV will be tested by government fleets in the next few months. Volkswagen's Spanish unit Seat said it is working on its first electric car, based on the Altea minivan, and a plug-in hybrid version of its Leon compact hatchback. Seat said it expects to launch the Leon plug-in hybrid car in 2015, followed a year later by the Altea electric car. The company said it will make available units of the Altea XL Electric Ecomotive and the Leon TwinDrive Ecomotive to government institutions in Catalonia and Madrid for use in their vehicle fleets over the next few months. "This will provide Seat with valuable information on use of the cars for assessment with a view to mass production of electric vehicles in the medium-term," Seat said. The Altea XL Electric Ecomotive will be aimed at families or fleet buyers who need a roomy vehicle. It has a range of 135 km and a top speed of 135 kph. The battery pack is located under the rear seats and in the trunk to maximize passenger and cargo space. 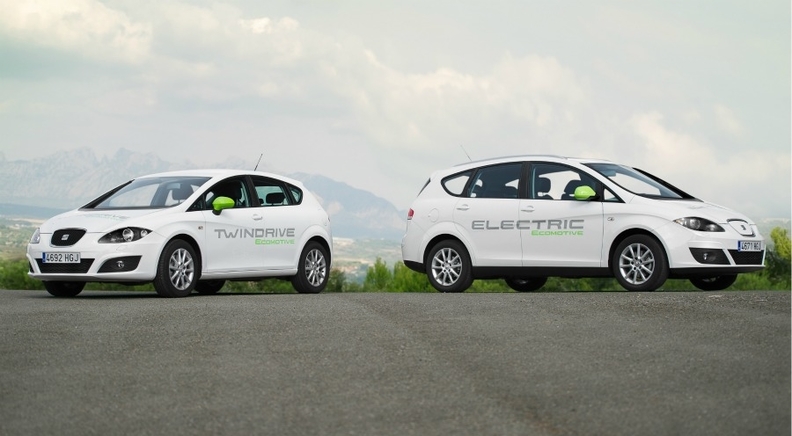 The Leon TwinDrive Ecomotive has a range of 52 km in electric mode, with a top speed of 120 kph. In combined mode using the electric motor and gasoline engine, the car's fuel consumption forecast is 1.7 liters of fuel per 100 km with CO2 emissions of 39 g/km, with a top speed of 170 kph. Seat President James Muir said the carmaker has adopted a parallel strategy of developing two different technologies to meet a growing but diverse customer demand for sustainable mobility. Seat plans its biggest model offensive to date with the launch of four new models over the next 12 months. The first will be the Seat Mii, the brand's version of the new VW Up minicar.